We all know that familiar scratchy, prickly feeling when you dread swallowing. Read on for some natural remedies to alleviate a sore throat. 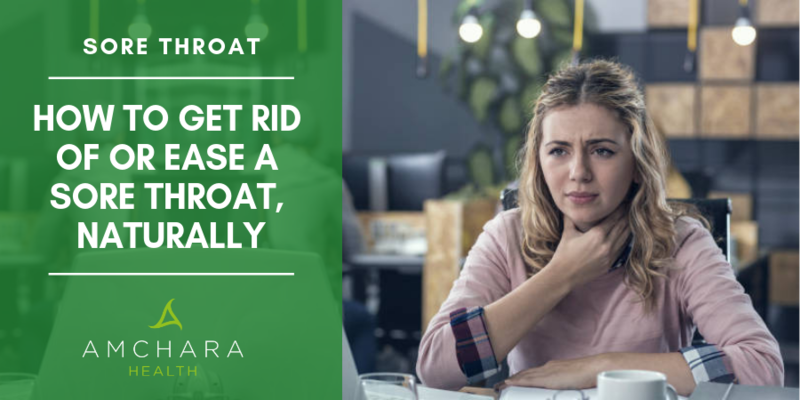 A sore throat can be the result of either a viral or bacterial infection. The throat, otherwise known as the pharynx, becomes inflamed and painful. Generally, the cause is viral, but if bacteria are the culprits, they usually belong to a family of bacteria known as streptococcal bacteria. These cause inflammation and swelling of the mucus membranes lining the throat. Strep throat is very painful and often accompanied by a fever. The best thing to help your body repair is lots of rest. A sore throat caused by a viral infection should go away on its own over time. But to make yourself more comfortable in the meantime, or even shorten your suffering, try the following natural remedies. Honey has been used as an antibacterial agent for thousands of years. The first reference to honey being used for medicinal purposes was written on a stone tablet found in Sumeria, now Iraq, dating back from 2100BC. Honey contains a naturally occurring enzyme called glucose oxidase (1) which is made by the bee. This converts the sugar in honey to hydrogen peroxide which kills bacteria. In studies (2) honey appears to be active against Streptococcus bacteria and can even effectively inhibit antibiotic-resistant bacteria. 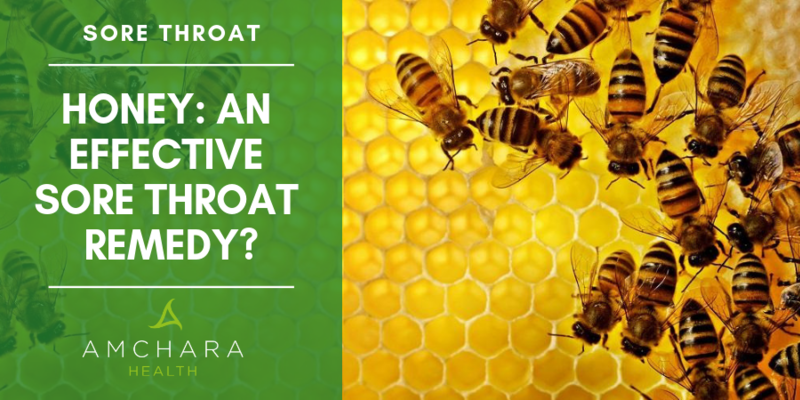 Honey naturally has a low pH which may assist its antibacterial action. It’s also high in sugar which can impede bacterial growth because it causes water to be drawn out of the bacteria and they dehydrate. There is a large natural variability in the anti-microbial activity of different honeys, due to diverse nectar sources. Many of the antibacterial properties of honey are destroyed if it is heated, which is what happens when honey is pasteurised. Look out for raw honey to gain the best effects. Manuka honey, from the Leptospermum Scoparium or Manuka tree, has a very high antibacterial activity. Naturally produced in New Zealand, the active ingredient of manuka honey is called Methylglyoxal, which is produced by the bee from manuka nectar. It’s also thought to be anti-inflammatory and coats the lining of the throat, soothing soreness. The NHS advises against giving honey to infants under one year old because occasionally honey can contain bacteria which can produce toxins in an infant’s digestive system. Otherwise known as salvia officinalis, sage is used in many ailments from ulcers to sprains and even hot flushes. In studies, sage has also been found to relieve throat pain. In one study, a sage mouth spray (4) was given to almost 300 patients complaining of a sore throat due to pharyngitis. Sufferers reported it significantly relieved throat pain. Sage appears to be especially effective when combined with echinacea purpurea, a popular herb believed to fight bacteria and reduce inflammation. Research has concluded (5) echinacea may be effective against viruses such as the rhinovirus, responsible for the common cold, influenza virus and Streptococcus bacteria. One study found a sage and echinacea throat spray (6) was more effective in relieving acute sore throat than a medicinal throat spray containing chlorhexidine, a drug-based antiseptic, and lidocaine, which acts as a numbing agent. » Steep one teaspoon sage leaves in water, add one teaspoon apple cider vinegar and one teaspoon honey. Officially known as zingiber officinale, ginger is well known amongst spices for its antibacterial and anti-inflammatory properties. Researchers looked at the effect of ginger extract in combination with an African remedy called bitter kola on throat swabs from people who had bacterial respiratory infections. » To make ginger tea, grate fresh peeled ginger root and steep in boiled water. Sweeten it with honey if needed and add the squeezed juice of half a lemon to power it up with extra vitamin C.
This soup is made by simmering a chicken carcass including the bones and adding practically any vegetables, herbs and spices you choose. The effectiveness of chicken soup is thought to be due to an amino acid called carnosine. This may decrease inflammation in the upper respiratory tract by stopping the migration of neutrophils, which are white blood cells. The soup also contains natural salt which is antibacterial. The steam from the hot soup may thin mucus and it’s hydrating due to its high water content. 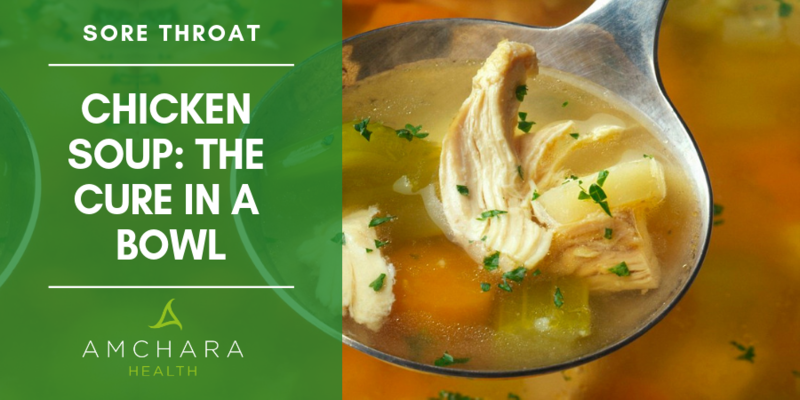 Here’s a recipe for a sore throat busting chicken soup. Originating from Europe and Asia, the name liquorice literally means ‘sweet root’. Liquorice root appears to act as an analgesic or pain-reliever. One study examined the use of liquorice post-operatively and found it reduced the incidence of post-operative sore throat, (8) which is common after a general anaesthetic. In this case, the liquorice was used in a gargle. Use 1-5g dried liquorice root to make an infusion by adding boiled water. Apple Cider Vinegar has been used as a natural remedy for thousands of years. In fact, Hippocrates himself used vinegar, along with honey, in a medicine he called Oxymel. Apple cider vinegar contains acetic acid which has an anti-bacterial action. The organic acids contained in the vinegar are thought to inhibit the growth of bacteria by destroying their outer membranes, competing with them for energy and slowing their metabolism. 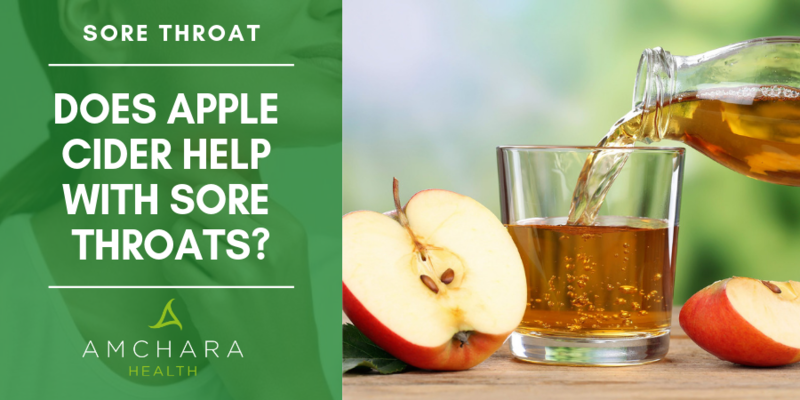 » Add 1 tablespoon apple cider vinegar to 250ml of warm water and sip, or for a sweeter concoction mix 60ml apple cider vinegar to one quarter cup of honey. » Apple cider vinegar can also be used as a gargle. Add 1 tablespoon apple cider vinegar and 1 teaspoon salt to a glass of warm water. One of nature’s great bacteria fighters, garlic has a role in combatting sore throats too. Raw garlic is both antibacterial and antiviral (9) and has been found to be active against the flu virus. The active ingredient in garlic is called allicin, which is responsible for its pungent smell and taste. » If you can bear to, chew on a raw clove or mince it and add honey. Or try garlic tea, which tastes far more delicious than it sounds! Known to play a role in immune health, research also suggests zinc can ease soreness when it comes into direct contact with the throat. A comparison of studies which looked at the effectiveness of zinc lozenges (10) found they reduced a scratchy throat by 33% and a sore throat by 18%. 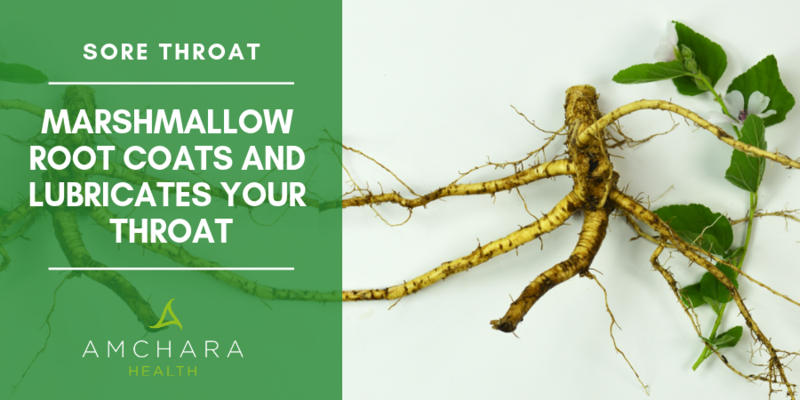 Not the sticky sweet but the plant, otherwise known as Althaea officinalis, marshmallow root has been found in studies to be effective against a sore throat. It contains a jelly-like substance made up of polysaccharides (11) which coats and lubricates throat membranes. One study (15) gave a combination of ivy leaf, thyme, aniseed and marshmallow root to 62 patients with an irritating cough and sore throat as a result of a cold. In 86% of cases, doctors and patients rated the remedy as very good and in 90% of cases, they rated it as good. » Make an infusion by popping 28g root in a muslin bag and leaving it to steep overnight in a litre of cold water. In the morning remove the bag and sip the liquid throughout the day. Coconut oil is known to be anti-inflammatory and antimicrobial. Add a teaspoon of virgin coconut oil to hot drinks, soup or take straight off the spoon. Cinnamon is a popular culinary herb which has traditionally been used as a remedy for colds and flu. It’s great as a tea combined with honey and lemon. Chamomile and yarrow (13) are two herbs which have traditionally been used as remedies for sore throats and appear to have antibacterial activity. Sip chamomile and yarrow tea when you’re suffering. Peppermint contains menthol which thins mucus and calms a sore throat. Scientists found essential oil of peppermint (14) inhibited bacteria as effectively as a medical antibiotic. Mix peppermint oil with a carrier oil such as sweet almond oil and rub on the skin of your throat and chest or use in an oil burner. You can even add peppermint oil to a gargle or make your own essential oil cough syrup with honey, lemon, lavender, peppermint and frankincense essential oil. Although it may seem counter-intuitive when your throat is sore and scratchy, hot peppers such as cayenne can be pain relieving because they appear to block pain signals. Try this remedy using cayenne, apple cider vinegar and honey as a gargle. 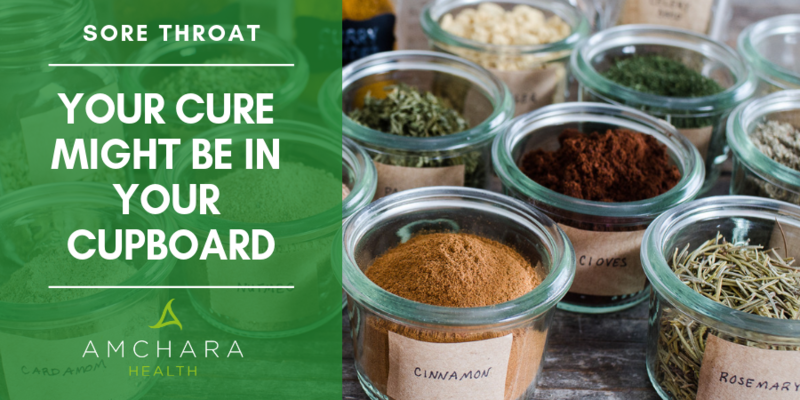 Make a sore throat tea using throat-supporting ingredients like lemon, honey, thyme and cinnamon. Keep up your fluid intake – it’s important to keep the throat moist. Sip plain water, or any of the teas or remedies mentioned above. Salt is naturally antimicrobial and the salt pulls water out of tissues to reduce swelling. Dissolve a quarter to a half a teaspoon salt in 100-200ml warm water, gargle for 30 seconds then spit out the solution. Use steam as dry air can irritate a sore throat. Make a simple steam inhaler by filling a bowl with very hot water, add a couple of drops of eucalyptus and breathe but be careful not to burn yourself. A humidifier in the bedroom can also help. Please remember, the above are general recommendations only and are not a substitute for a doctor’s advice. The NHS recommend you seek your GP’s advice if a sore throat persists for more than one week, or if it’s accompanied by fever, which may indicate a bacterial infection such as strep throat. If you often suffer from coughs, colds or sore throats, it could be a sign your immune system is struggling. 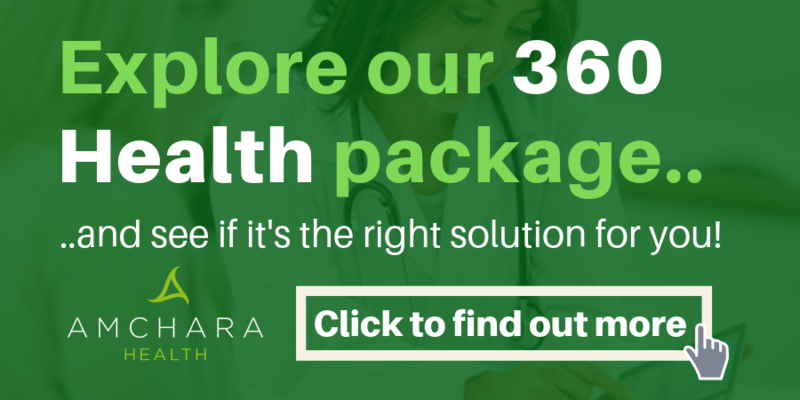 A personalised health consultation with an experienced Amchara practitioner could help to naturally support your immune system and maximise your health.